This article gives you complete details about Pankaj Adwani who is one of the best snooker player from India who had won seven world titles in his career. More details about the biography, profile, championships and awards won by Pankaj Advani are quoted in this article. 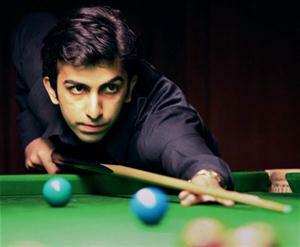 Pankaj Advani is one of the best snooker players from India. Pankaj Advani was born in the year 1985 July 24 at Pune. Pankaj Advani was the holder of seven world titles in billiards and snooker. Pankaj Advani is one of the best billiard player from India. Pankaj Advani had won many awards which include Padma Shri, India's fourth highest civilian honor, in 2009, The Rajiv Gandhi Khel Ratna Award, in 2006 and the Arjuna Award in 2004. Pankaj had completed his schooling from Frank Anthony Public School, Bangalore and Bachelor's degree in Commerce from Mahaveer Jain College, Bangalore. At the age of 10 itself, Pankaj showed his brilliance in snooker. Pankaj won his first title when he was 12 years old. Pankaj won his first Indian Junior Billiards Championship title in the year 2000 and he continued that winning rally in the year 2001 and 2003 also. Pankaj holds the record of youngest National Snooker champion in the year 2003. Pankaj began his International career in the year 2002 where he became the finalist in Asian Billiards Championship 2002 conducted in Bangalore. His winning streak continues in the year 2003 and 2005 where he won IBSF World Billiards Championship in both years. In 2009 Pankaj won his first world professional championship. More details about the title and awards won by Pankaj Adwani are given below. * Rajyotsava Award, Karnataka's highest civilian award, 2007. * Karnataka's 'Kempegowda Award" in 2007. * The Rajiv Gandhi Khel Ratna Award in 2006. * Vision of India's "International Indian" Award in 2005. * The Sports Star Sportsperson of the Year 2003.